Similar to a porch, a four-season sunroom can either connect to the structure of a house or be freestanding (detached). What differentiates sunrooms from other kinds of structures are the many windows, rather than screens. A sunroom lets you comfortably stay indoors, possibly with your central air conditioning and heat, while still enjoying the outdoors and the view outside. Like a greenhouse, sunrooms are ideal for growing a variety of plants as well creating space to entertain and relax. Enjoy the serenity, energy, and beauty of nature 365 days a year no matter what climate you live in. A light-drenched four-season sunroom allows you to reap the benefits of a pleasing outdoor living space all year round without inclement weather, irritating pests, or other annoying disturbances. Clinical studies show how important natural light is to both the physical and emotional well-being of people. In many colder regions, some people struggle with SAD (Seasonal Affective Disorder), which is a type of depression related to seasonal changes. 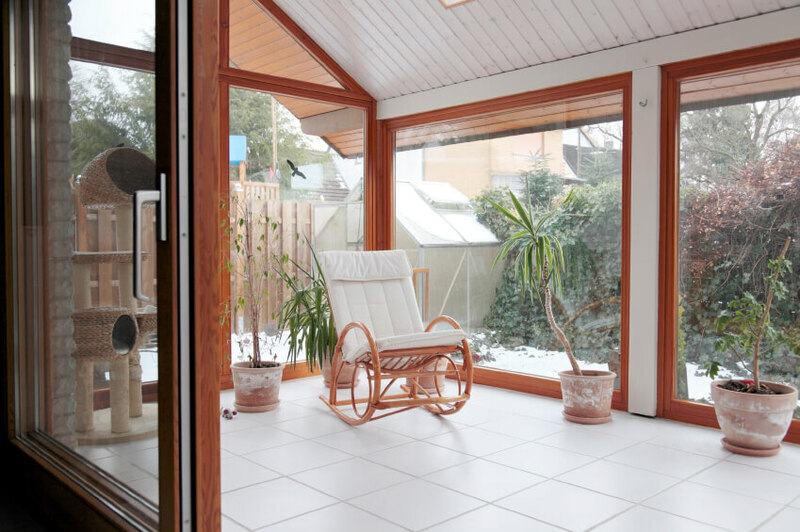 A sunroom can effectively offset several symptoms of SAD during the dreary colder months including the “winter blues,” moodiness, and a lack of energy. Sunrooms are essentially a veil between the outdoors and indoors, and therefore make the perfect spot for all kinds of greenery and foliage due to the ample natural sunlight filtering through. A four-season sunroom addition is perfect for family gatherings, special occasions, or a place to simply relax. People are naturally drawn to the uniqueness of a sunroom whether it’s to read, drink morning coffee, chat with friends, or even star gaze at night. Sunrooms are often the most popular space in the house. Today, many people telecommute and work from home. What better place to set up a home office than a four-season sunroom? All it takes is a desk, chair, and a Wi-Fi connection and you’re ready to go. Think of how much more work can be accomplished when surrounded by the beauty and richness of nature. The ambiance itself is truly inspiring and can potentially motivate anyone to focus better on their work and therefore be more productive. Whether you want a cozy space for the family to gather, a relaxing spa-like retreat, or a quiet sanctuary for afternoon tea and a good book, adding a four-season sunroom can accommodate virtually any need or desire. Today’s four-season sunrooms can be customized or purchased in a kit for the experienced DIYers. Sunrooms with glass-encased ceilings provide an extraordinary view of the amazing starry night sky.